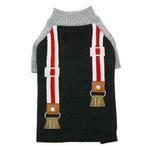 Your dog will be looking extra dapper in the Suspender Dog Sweater by Dogo! 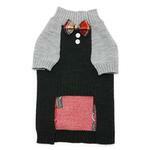 The Suspender Dog Sweater by Dogo will keep your dog stylish and warm. 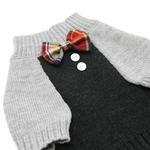 This soft knit pull over sweater has an adorable faux suspender design on back with a matching bowtie and buttons on the front. Machine wash in cold. Cut high on the belly to avoid potty messes. Leash hole for added convenience. 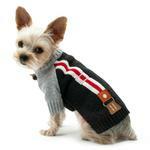 Great for those chilly evening walks! Easy to shop and order.